In 2007 we began to look at bringing the highly innovative and very popular Street View to Europe, and I highlighted the new technological challenges this would present given different privacy laws and cultural norms. We pre-empted many of the different requirements and concerns and proactively introduced privacy enhancing technologies, namely industry-leading face and license plate blurring, and made it easy to flag inappropriate images for removal. We began a dialogue with the Article 29 Working Party, which brings together representatives from all 27 European Data Protection Authorities. In turn, they have asked us to make a few additional modifications to address local specificities to ensure Street View better aligns to local interpretations of privacy requirements across the whole of Europe. First, they have asked us to continue to provide advance notice to the public about the project before we start driving in a new country. We already got a head start on this request earlier this year, when we worked closely with the press to announce details of when and where we would be driving in new countries such as Ireland, Belgium, Sweden, Norway, Finland, Denmark, Poland, Czech Republic, and Switzerland. As you can probably imagine, it can be tricky at times to say exactly where our cars will be and when; we're affected by lots of things outside our control such as the weather and lighting conditions, we also rely on the local knowledge of our drivers to decide which places it is best to drive when, taking into account traffic conditions and other local factors. Nonetheless, we are committed to working within the Article 29 Working Party's guidelines on this issue. Second, the Article 29 Working Party has asked that we set a time limit on how long we keep the unblurred copies of panoramas from Street View, in a way that appropriately balances the use of this data for legitimate purposes with the need to deal with any potential concerns from individuals who might feature incidentally on the Street View imagery. To explain the issue here, although the images you see on Street View have faces and car license plates blurred out, we have to collect an original 'unblurred' copy of that image first. We then apply our highly sophisticated blurring technology and we make sure that only the blurred copy is ever made public. The Article 29 Working Party have, however, asked us to take some additional steps to ensure that we don't keep the original 'unblurred' copy for longer than we need to. This is a challenge, but again one we're committed to meeting not just in Europe but globally. One of the technical challenges at stake with Street View--or any service that uses image detector software --is that the software sometimes makes mistakes, labeling part of the image as containing a face or a license plate when in fact it doesn't. While we like to think we've gotten pretty good at this stuff, we still have lots of these 'false positives'. 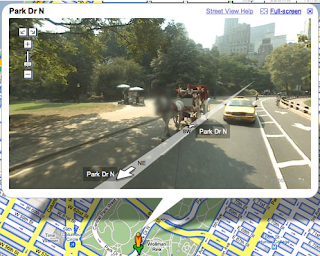 Some of these can be pretty funny like the blurred horse shown above, but this also affects the quality of Google Maps and so in turn affects our users - for example, it'd be pretty annoying if you couldn't find the phone number of that little deli across town where you think you might have left your purse, because our software mistook the phone number for a license plate. That's why we're constantly working on ways to improve our technology, and we are constantly training it to detect more of the relevant stuff, while reducing the number of 'false positives' it creates. To do this, though, we need access to the original unblurred copies of the images. Nevertheless, we've communicated to the Article 29 Working Party that we will meet their request that long term we only keep the blurred copy of Street View panoramas, and we will work with them and our engineers to determine the shortest retention period that also allows for legitimate use under EU laws. It's important for companies operating services across Europe to be able to follow harmonised data protection guidance, and we're grateful to the Article 29 Working Party for their advice and collaboration on Street View. It is this coordinated approach that will best enable the expansion of consumer-facing services and innovative technology across the region. Street View has proven to be extremely popular in the countries in which it has launched and with these additional privacy safeguards we plan to bring it to even more countries in the European Union, allowing people to explore their home towns, tourist attractions or cities on the other side of the world. We are already receiving many requests to come drive new areas so that imagery can be used to showcase a town, promote tourism and improve travel planning and we are of course always happy to consider these. Read about our latest addition to Street View - tourists and Mickey Mouse fans can now virtually explore the Disneyland parks in Paris.